The Best Seattle blogs from thousands of top Seattle blogs in our index using search and social metrics. Data will be refreshed once a week.Also check out Top Seattle Youtube Channels list for Top videos on Seattle. Seattle newsletter is a comprehensive summary of the day's most important blog posts and news articles from the best Seattle websites on the web, and delivered to your email inbox each morning. To subscribe, simply provide us with your email address. Seattle, WA About Blog The Stranger, Seattle's Only Newspaper: Covering Seattle news, politics, music, film, and arts; plus movie times, club calendars, restaurant listings, forums, blogs, and Savage Love. Facebook fans 113,173. Twitter followers 122,843. Seattle, WA About Blog Smart. Authoritative. Entertaining. With a bold design, eye-catching photography, and an editorial voice that's at once witty and in-the-know, Seattle Metropolitan is our city's monthly indispensable news, culture, and lifestyle magazine. Facebook fans 56,138. Twitter followers 192,563. Seattle, WA About Blog Welcome to the official source for information on visiting Seattle, Washington. Lodging, entertainment, food/drink, sports, attractions & more. Facebook fans 462,747. Twitter followers 37,439. Seattle WA About Blog The Seattle Restaurant, Bar, and Nightlife Blog. Food news and dining guides for Seattle. Facebook fans 25,954. Twitter followers 19,880. West Seattle About Blog West Seattle news, information, and discussion, updated multiple times daily, 24/7/365. Facebook fans 29,534. Twitter followers 57,997. San Francisco, CA About Blog News, current events in & around Seattle, Washington, USA. Facebook fans 1,175,547. Twitter followers 534,609. Gelderland, Netherlands About Blog Your connection to the voices of Seattle Art Museum. Learn more about our global collection, local community, and renowned exhibitions from anywhere in the world. Facebook fans 113,976. Twitter followers 84,683. Seattle, WA About Blog Your best source for quality Seattle Seahawks news, rumors, analysis, stats and scores from the fan perspective. Facebook fans 29,113. Twitter followers 27,221. Seattle, WA About Blog Your best source for quality Seattle Mariners news, rumors, analysis, stats and scores from the fan perspective. Facebook fans 49,487. Twitter followers 20,687. Seattle, WA 98112 About Blog Community News For All the Hill. CHS Capitol Hill Seattle is a community site dedicated to the Capitol Hill neighborhood in lovely Seattle, Washington USA. We started as an independent, place-focused blog in January 2006 and have grown to incorporate voices from all over the Hill. Facebook fans 15,328. Twitter followers 49,589. Ballard, Seattle About Blog News, events and restaurants for Seattle's Ballard neighborhood. Facebook fans 15,549. Twitter followers 25,127. Seattle, WA About Blog Every aspect of living in Seattle, for people who care about their city, their streets, and their homes. Facebook fans 6,473. Twitter followers 5,178. Seattle, WA, USA About Blog Local real estate news, statistics, and commentary without the sales spin. Facebook fans 522. Twitter followers 2,129. Seattle About Blog Seattle Bike Blog is independent pedal-powered news and opinion since 2010. The Seattle Bike Blog is a daily, comprehensive look at bicycling in Seattle. Facebook fans 3,472. Twitter followers 11,174. San Francisco, CA About Blog This reddit is for discussion of the Seattle Mariners baseball club. Facebook fans 1,175,390. Twitter followers 534,470. San Francisco, CA About Blog A community for fans of the Seattle Seahawks. Go Hawks! Facebook fans 1,175,532. Twitter followers 534,606. Seattle About Blog The ultimate home for Seattle Mariners news, rumors, updates, trades, signings, injuries, commentary, analysis, and more! Facebook fans 536. Twitter followers 1,767. Seattle About Blog The ultimate home for Seattle Seahawks news, rumors, updates, trades, signings, injuries, commentary, analysis, and more. Facebook fans 11,474. Twitter followers 5,468. Seattle, WA About Blog What started in 2006 as a blog about Seattle real estate with an emphasis on lofts, condos, new construction and mid-century moderns has evolved into a boutique real estate company. We still blog, but more importantly we can now help you buy and sell amazing homes in the Seattle area. Facebook fans 1,543. Twitter followers 1,529. Seattle, WA About Blog Mercedes-Benz of Seattle is a Mercedes-Benz dealership located near Seattle Washington. We're here to help with any automotive needs you may have. Don't forget to check out our used cars. Facebook fans 2,044. Twitter followers 180. Seattle About Blog Seattle DogSpot is a locally focused website that is the most comprehensive resource and online community for all things dog in Seattle. Facebook fans 12,501. Twitter followers 3,298. Green Lake, Seattle About Blog News, culture, and lifestyle from the Green Lake neighborhood. Facebook fans 1,635. Twitter followers 964. Seattle About Blog Pan Pacific Seattle is a four-star Seattle luxury hotel that welcomes guests with exceptional hospitality and a distinct, Pacific Northwest vibe. Facebook fans 9,951. Twitter followers 879. Seattle, WA About Blog With a pulse on the latest in dining, travel, fashion, entertainment, events and more, Seattleite is the premiere lifestyle resource to deliver the latest news and happenings around the city, showcasing the best that the Puget Sound region and the Pacific Northwest has to offer. Facebook fans 5,403. Twitter followers 11,783. Seattle, WA About Blog EatSeattle is a leading food and lifestyle publication that showcases restaurants news, reviews, and eye-catching photography in the Pacific Northwest. Facebook fans 757. Twitter followers 12,173. Seattle, WA About Blog LoveLicton is a blog dedicated to everything happening in and around the Licton Springs neighborhood in Seattle, WA. Facebook fans 39. Twitter followers 17. Facebook fans 81,354. Twitter followers 26,699. Seattle, WA About Blog 350 Seattle is building a passionate grassroots movement for climate justice. We’re a grassroots organization passionate about climate action and ecological justice. Everyone has skills and energy that we need. Facebook fans 5,411. Twitter followers 1,344. Arlington, WA About Blog The Herbalist and The Carnivore is a home cooking and lifestyle blog based in the Pacific Northwest bringing you fresh, local food, recipes, reviews and outdoor adventures. Facebook fans 3. Twitter followers 6. Seattle, WA About Blog A guide to Seattle condos and Downtown Seattle condos for sale. Longest running Seattle condo blog since 2006. Facebook fans 1,384. Twitter followers 338. Facebook fans n/a. Twitter followers 3,665. Facebook fans 87. Twitter followers 13. Seattle About Blog A news blog in the Seattle Wedgwood and View Ridge neighborhood. Facebook fans 1,153. Twitter followers 2,691. Seattle About Blog This Seattle Real Estate blog is meant to give an overview of all types of Seattle real estate including residential sales and rentals, commercial sales and leasing, and property management. Seattle, WA About Blog Find real estate in Greater Seattle. Use McAuley Real Estate search engine to find Greater Seattle real estate by price, bedrooms and more. We have every listing from every real estate company in the Greater Seattle area. Facebook fans 62. Twitter followers 170. Seattle About Blog Muriel's Landing offer luxury amenities and is a premier University District Apartment in Seattle offering 1 bedroom & studio apartments for rent. 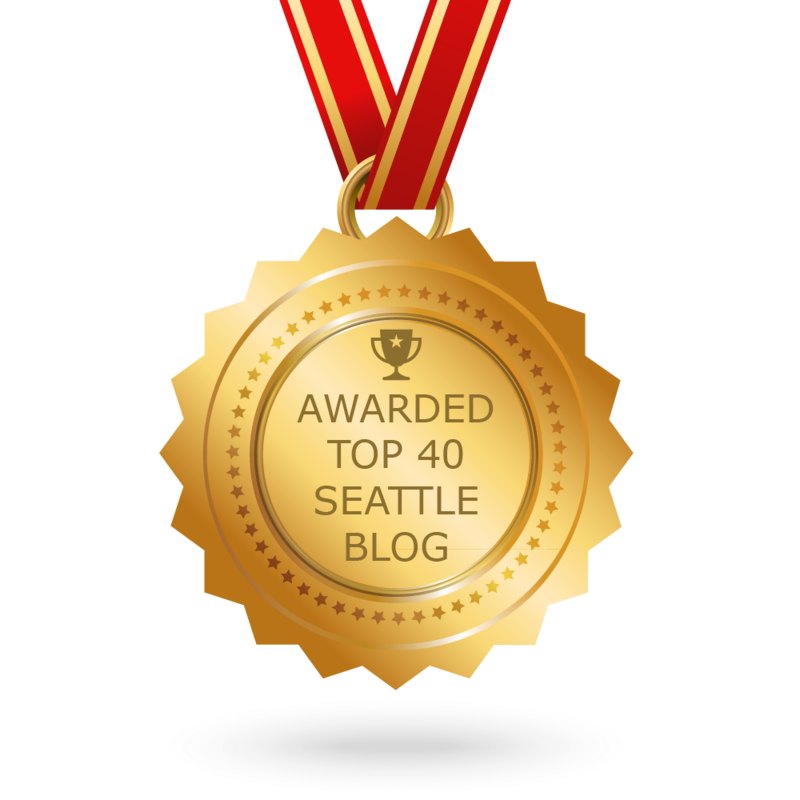 CONGRATULATIONS to every blogger that has made this Top Seattle Blogs list! This is the most comprehensive list of best Seattle blogs on the internet and I’m honoured to have you as part of this! I personally give you a high-five and want to thank you for your contribution to this world.